Not only students are learners; parents must be learners too! Here you will find articles on many topics in mathematics education that provide information and insights into how students learn from pre-school through high school, and the role that parents and families can play in a child’s success in this important subject. The articles made available for download on this page are meant to increase parents’ and guardians’ knowledge* of mathematics education in three key areas: curriculum (what we teach), instruction (how we teach), and assessment (how we measure what students learn from our teaching). *The articles listed below are not meant to be the last word on any topic. Instead they are provided to help your thinking about mathematics learning. Permission is granted to reproduce and share the articles and/or activities downloaded from this web page for instructional use by parents, guardians, teachers, and families, provided they are duplicated with full credit given to the authors, the ComMuniCator Journal, and the California Mathematics Council. There are countless board-games that are fun and entertaining, but did you know that some board-games can help build strong minds? 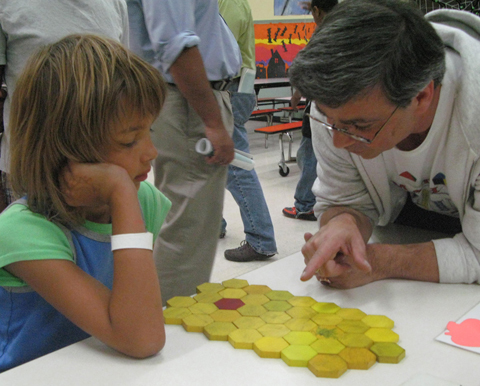 Learn how abstract strategy games can benefit your whole family, from children all the way to seniors. There may be more to playing games than you think! The ability to estimate using mathematics is more important than you think. It may not give the exact right answer, but we use estimation every day when all we need is a good “guess” to make a decision. Estimation is important, but it is definitely a learned skill. Find out why parents are in a perfect position to teach this skill. In Part I of The Art of Guessing, we try to convince you that you can play a significant role in teaching your child to be a good estimator. In Part II, we make some suggestions on just how you might do that—and have a bit of fun doing so! California has just joined 40+ other states in adopting a new, national set of reading and mathematics education standards called the Core Standards. Soon our teachers will begin to teach to these new standards, and our children held accountable to their goals. One of the major differences in this new set of standards is a recommended set of learning practices, because the Core Standards not only describe in detail WHAT every K-12 student should learn, but HOW they should learn. This article focuses on these very important Standards of Mathematical Practice. The Common Core Standards for Mathematical Practices are important because they give us an overview of the 21st century skills all Kindergarten through 12th grade students must learn to be successful adults. It is critical that ALL families understand these important practices. This translation of the Practices is meant to make the Mathematical Practices accessible to Spanish-speaking parents. Some of the most common questions asked about the Common Core can be easily found. Here is a set of questions frequently asked, and a clear and concise answer to each question. They are taken directly from the official Common Core web site. While you might think that volunteering to help at math time in your child’s classroom is a scary idea, there are a lot of very good reasons why you should. The experience will benefit the students, their teacher, your child, and it will give you insights into how to better work with your own children with mathematics at home. There are many state and federal programs that affect your child’s education in school. These programs are often referred to only by their acronyms—the initial letters of their words. This is a list of acronyms and program names which every parent should be know. There are many special terms in education. This article lists terms you will find useful to know when talking with teachers, counselors, and administrators. Parent/Teacher conferences can be a key factor in supporting your child’s learning, both in school, and at home. This article contains useful advice on questions, student work, and communication with your child’s teacher. Make the most of these conferences! The mathematics students study in Kindergarten through 7th grade has changed dramatically over the last dozen years. This article explains the five subjects, or stands, of mathematics that the California Curriculum Standards mandate that students study EVERY year. The high school mathematics courses that are now offered, and the current requirements for graduation and entrance into college, have changed dramatically over the last ten years. Even if you haven’t taken these courses yourself, you can help your high school student succeed in mathematics by understanding just what is required now to succeed at this level. It’s too much to expect all parents to know everything about their children’s mathematics education. We all learn by asking questions; this article is a list of frequently asked questions about current topics and issues in the math classroom. The California Mathematics Curriculum Standards are the key to understanding the mathematics that is taught at each grade level from Kindergarten through high school. In this article you can read about some of the basics topics and concepts outlined in the Standards and where to go if you want to know more! Every six or seven years, new mathematics textbooks appear in schools. They don’t just suddenly happen. In this article learn what parents should know about the rigorous six-year process new textbooks must go through in California before they are approved for use in public schools. The mathematics curriculum in K-8 public schools includes topics in Number, Geometry & Measurement, Algebra, Statistics & Probability, and Problem Solving. In this article you will learn why Problem Solving is equally important and necessary as all the other mathematics topics. In Part 1 or this article, you learned the “why” of Problem Solving. In Part 2, you’ll learn what every parent should know about how to help and support their student in learning to be a good problem solver!